To strengthen the ongoing water collaboration between Myanmar and The Netherlands, The Water Agency and the Netherlands Water Partnership organized a visit to Rotterdam, The Hague and Amsterdam by the Chief Minister of the Yangon Region, H.E. Phyo Min Thein. Taking place from 3 till 6 June 2018, the Chief Minister was joined by a high-level government delegation including the Minister of Agriculture, Livestock, Environment and Forest, H.E. U Han Htoon and the Minister of Electricity, Industry, Transportation and Communication of Yangon Region Government, H.W. Daw Nilar Kyaw. The delegation was accompanied to the Netherlands by H.E Ambassador Kingdom of the Netherlands in Myanmar, Wouter Jurgens and Dutch Water experts to guide them through the integrated journey (process) of the Netherlands becoming a water-resilient country. 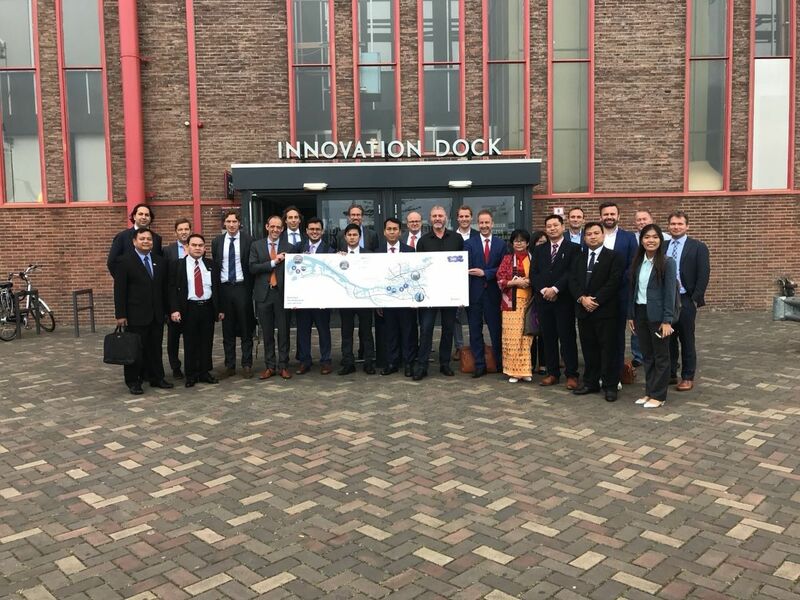 The delegation visited the cities of The Hague (Water Governance), Rotterdam (Smart Port) and Amsterdam (Circular Urban Water) to experience the Netherlands Water expertise in action. The focus was not so much on the solutions – but more on how to integrate water strategically into Yangon masterplans. The Chief Minister of Yangon emphasized the importance of bringing different water stakeholders together in Yangon. He summarized the value of the RDM campus as "Inspired innovation for future generations".